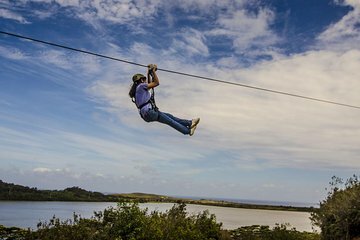 Steigen Sie durch die üppigen Wälder von Kauai und über den Waita-Stausee auf den längsten Ziplines der Insel! Halten Sie sich beim Überqueren des achtspurigen Kurses in der Nähe von Koloa am Lenker fest oder probieren Sie weitere verwegene akrobatische Stunts mit dem Freisprechgerät "Flyin 'Kauai'an". Kinder können für ein Duell-Abenteuer im Tandem fliegen, und Reißverschlüsse aller Altersklassen werden den Nervenkitzel der halben Kilometer langen Waita-Linie spüren. I have done a few zip lines and so far this one has been the best. You get to fly laying on your stomach and are also allowed to go upside down on one of them. The last one is a really long line and you get lots of speed. The guides we had were friendly and really tried to make everyone laugh and feel comfortable. amazing experience and Allie and Brigg were so great, fun and wonderful to be around assisting us. This was such an amazing event! Everything about it was top-notch... from the easy going nature of the staff, the process, the great attention to safety and comfort, I felt very comfortable as we headed out for our adventure. Our guides, Phil and Ozzie, were the best! They were very funny and kept us all at ease the entire trip. Our harnesses were constantly being checked and re-adjusted if needed. Their knowledge of the area and history of the island added another layer that really enriched the entire experience.... and of course, the half-mile line was pretty spectacular too! I would highly recommend this company as you will get more than just a trip down a cable! Phati and Rusty took great care of us. My family had an amazing experience and the view was breath taking. This venture was fantastic! A lot of walking uphill w/gear, so you need to be in good shape. Felt like I was flying solo!! LOVED IT! LOVED IT! LOVED IT! The Zips and guides were great. The photos were disappointing and the office staff surly so take your own pics. Great fun. The tour and guides were amazing! Very nicely built.......not like the sketchy ones in Mexico and other countries I've been on. They took their time ama did not rush us through. This was fun, the guides were very polite and friendly and made the experience very good. We would do it again. This is a semi physical activity so if you have any sort of medical condition that will keep you from hiking this is probably not for you. The guides were awesome and the views were amazing. They had drinks and snacks half way through the tour. We got to ride in a very nice air conditioned bus on the way out. Our guides gave us some history on the land which was very interesting. On the way back to our starting point we road in an army truck which was cool too. The whole experience was great. 1 tip, make sure to take bug spray! I didn't and got bit up something severe! Other than that it was memorable and I would definitely go again! !